There were three streams all flowing east, and near them a tribe of Indians was camping. 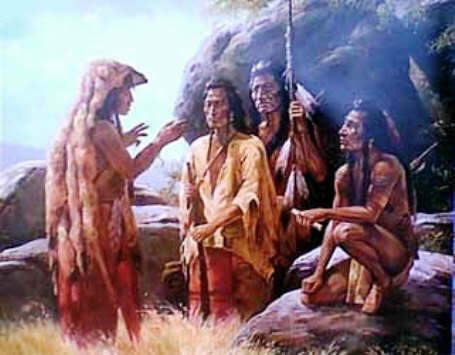 A brother and sister were playing at a distance from the camp, and a Chief passed by them. The children called him saucy names and he was very angry. Going to the camp he bade all the people pack up, and move to another camping-ground. Before moving away, the people took the two children who had been saucy to the Chief, and tied them each to a pole. They leaned the poles against some trees, and leaving the children to die, they took their goods, and went to another place. Well, the poor children suffered hunger and thirst, and wept bitterly. At last an old Wolf, the Chief of all the Wolves, saw them, and he said to himself, "How pitiful these children are!" Then he cried out to the pack, "Come, all ye Wolves, from all directions!" "I pity these children. Seize the poles and lower them slowly. Then chew off the ropes and free the children." "Do not be afraid! Stay with us, and we will care for you." After that he called four big Wolves from the pack, and said: "You, Clouded Wolf, who are above all others in daring deeds, provide food for this boy and girl. White Wolf, I want you also to look for food for them. Black Coyote, go out and find meat. And you also, Black Wolf, who are brave and cunning, provide meat for them." Immediately the four big Wolves ran away, and soon came back laden with the best parts of a Buffalo; and piled all the meat in front of the children. The brother and sister ate, and were made strong again. Then the old Wolf told them to go into the timber near by, and live there; and he said that he would stay with them. It was now Winter. The boy got together some poles and made a frame for a brush house; while his sister gathered long reeds, and with them thatched the house. She made a door of brush and sticks, and inside she put brush for two beds. They then made a nice comfortable bed near the door where the old Wolf might sleep. When the house was finished, it began to snow. They all went in, and the old Wolf said, "I am feeble, and suffer much from cold. I have no strength, no swiftness, no warmth. If it were not for your kindness I should be out in the snow. Therefore I thank you for letting me live with you in this comfortable house." So that night the Wolf slept by the door, the girl slept on the north side of the house, and the boy at the back. Well, in the morning the boy was the first to get up to make the fire; and he looked out, and the snow was over all the land. And what was his surprise to see great herds of Elk near by. The whole snow was yellow with them as far as he could see. In the timber, on the banks of the rivers, and everywhere, the Elk were standing, walking, or lying down. The boy shut the door quickly, and said to his sister, "Get up! There are herds of Elk close by." "Why should I get up?" said she; "I can't do anything." But the boy answered, "Just get up and look at them anyway." "I can't do anything by looking at them," said she. "My Grandchild," called the old Wolf, "get up and look at the Elk." So she rose, and opened the door; and as soon as she looked at an Elk, it fell down dead. Then she gave her brother a flint knife with a bone handle, and he ran out into the snow, and skinned the Elk as easily as if he had always known how to do it. As soon as he had skinned the animal, he threw its hide into the house, and the girl folded it three times, and sat on it. Immediately the hide became a soft and beautiful skin, all dressed ready for use. Then the girl looked at more Elk, and they fell down dead; and the boy skinned them; and so she did until they had thirty-six skins. They next sliced the meat, and hung it to dry on the trees near the three streams. After that the girl took some of the thirty-six skins, and piling them one on the other, she sat on them, saying, "I wish that all these skins may be sewed together for a tent." And when she got up, and spread them out, they had become a tent with a bird ornament on top, and four round ornaments on the sides, and rattles over the door. Then the girl said, "I wish for twenty-nine straight tent poles." And when she went outside, there were the tent poles made of otter-weeds. Soon the tent stood covered, and was very handsome. Then the girl folded three skins, and sat on them, saying, "I wish for a wall-hanging embroidered with Porcupine quills of every colour." And it was so, for when she got up the Elk skins were changed into a beautiful hanging, which she fastened behind her brother's bed. Then she folded three more skins, and sat on them, and wished for an embroidered hanging for her bed, and she got it. After that she did the same to more skins, and wished for an embroidered and ornamented blanket, and she gave that to the old Wolf. Well, after seven days it snowed again, and when the boy got up to make the fire, he looked out and saw the snow over all the land. And what was his surprise to see great herds of Buffalo near by. The whole snow was black with them. He waked his sister, and bade her get up, but she said: "What can I do? You have broken my sleep. Let me sleep longer." "My Grandchild," called the old Wolf, "get up and look at the Buffalo." So she rose, and opened the door, and as soon as she looked at some of the Buffalo, they fell down dead. The boy skinned the animals, and brought in their hides. The girl took one, and folded it three times, saying, "I wish this to become a robe with bird ornaments." Then it became an embroidered robe, and she gave it to her brother. Then she took another skin and did the same, saying, "I wish this to be a painted robe for myself." And it turned into a robe; and when she spread it out the painting was seen bright and beautiful. Then she took another skin, and, in the same manner, made it a robe with red and yellow embroidery at the four corners, and eight lines of embroidery across it, and between them black lines painted with charcoal. This she gave to the old Wolf. After that she made three pillows for the beds. On the one for her brother was the picture of an animal embroidered in yellow quills. The eye was dark with yellow quills around it. On the throat were a hundred bars of yellow quills. The ear was a yellow cross of quill-work. The head was round, and the tail and nose were bars of yellow quills. All around the edge of the pillow were fifty bars of yellow quills. The pillow for the girl was white, embroidered with an animal made of black and white bars of quill-work; while the pillow for the old Wolf was very beautiful, embroidered with red and yellow quills. Well, after seven days it snowed again, and when the boy got up in the morning to make the fire, he looked out and saw the snow covering the land. And what was his surprise to see more herds of Elk near by. The snow was yellow with them. He called his sister, and the old Wolf bade her rise and look at the animals, and she did. Immediately some of them fell down dead. Then as before, the girl folded, and sat on their skins, and wished for a fine hunting-shirt for her brother, embroidered in circles of red and yellow quills, with fringes along the edge, and tufts of long hair hanging between the fringes. Then she wished for leggings for him, and a pair of moccasins embroidered with birds. For herself she wished for a woman's dress handsomely embroidered, and with four rows of fringes, also for leggings and moccasins. As the old Wolf could not wear clothes, she of course did not wish for any garment for him. Then the boy said, "I wish I could have for a Dog a Panther of yellow colour with white sides." His sister went outside the tent, and called, "Come, Panther of yellow colour with white sides!" And immediately the Panther came walking through the timber, slowly twisting his tail. He entered the tent, and lay down by the boy, and put his head on the boy's knee. Then the boy said, "I wish you could have for a Dog a Bear with white streaks down his fore legs, and whose claws are white with black streaks." So his sister went outside the tent, and called, "Come, Bear with white streaks down your fore legs, and with claws white with black streaks." And immediately the Bear came pacing through the timber, and sat down at the foot of the girl's bed. After that the brother and sister lived very happily with the old Wolf, the Panther, and the Bear. They had plenty to eat, for the dried meat was piled up before the door of the tent, and there was meat still hanging from the trees. One day two Indians from the tribe that had deserted the children, happened to be hunting by the streams, and they saw the handsome tent in the timber. They went toward it, and, lo, there were the boy and girl beautifully dressed; while on one side of the tent sat the Panther, and on the other side the Bear, and the old Wolf was lying just in front of the door. Well, when the animals saw the men, the old Wolf rose up growling, the Panther crouched to spring, and the Bear stiffened his hair. The men were very much frightened, but the boy told the animals to lie down, and he invited the men into the tent. The girl bade them be seated, and gave them pemmican in wooden bowls. Now the men saw the wonderful tent and all its fine furnishings, and they looked at the great pile of dried meat before the door, and said to the children that they would return at once to the tribe, and tell the people to come and see them. But the girl said that if they came, they must camp down by the streams, and not approach the tent, or the animals would kill them. So the men went back to the people, and the tribe came to the streams, and made their camp. And though they could see the beautiful tent in the distance, they dared not approach it for fear of the animals. But the brother and sister gave some of their meat to the people, and after that the two continued to live happily in their tent, guarded by the faithful old Wolf, the Panther, and the Bear.